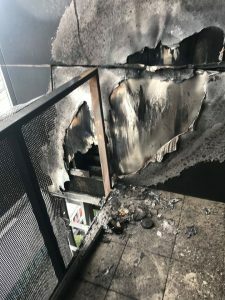 The recent high-rise apartment blaze in Melbourne displaced residents and added momentum to the push to reform the national construction industry. Among the reforms under consideration is mandatory national registration for engineers, and today Engineers Australia urged building ministers from around the country to get on with the job. Engineers Australia CEO Peter McIntyre attended the Council of Australian Governments (COAG) Building Ministers Forum (BMF) in Hobart earlier today. There, he emphasised the need for prompt action to implement the recommendations of last year’s Building Confidence report, authored by Professor Peter Shergold and Bronwyn Weir. “The nation’s building ministers know what Engineers Australia wants: a national system for registration of engineers and a timetable for implementation of all Shergold and Weir report recommendations,” McIntyre told create. Currently, Queensland is the only state with mandatory registration for engineers, although Victoria is in the process of developing a bill to follow suit. 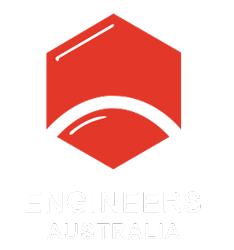 According to McIntyre, the Engineers Australia National Engineering Register (NER) has been available for governments to call up into legislation since 2015. “We now need the legislative backing for the register to give it greater impact in ensuring best-practice engineering is always used on projects,” he said. 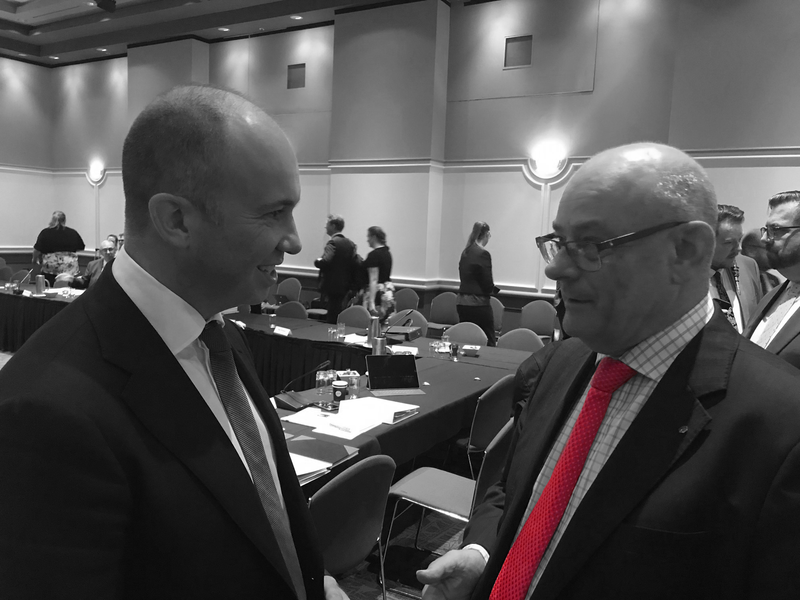 Engineers Australia CEO Peter McIntyre (right) and NSW Minister for Innovation and Better Regulation Matt Kean at the Building Ministers Forum. Following the evacuation of residents from Sydney’s Opal Tower over Christmas due to cracking of concrete panels, Engineers Australia has also been in discussion with NSW minister for regulation Matt Kean about the importance of mandatory registration for engineers involved in building certification. While the official report into the cause of the blaze at Melbourne’s Neo200 high-rise apartment building is yet to be released, experts have indicated that the amount of combustible cladding was restricted to a small strip. “Early indications are that the design of the building appeared to work as intended. But of course we expect some lessons learned to become evident once the report has become public,” said Engineers Australia National Manager for Public Affairs Jonathan Russell. McIntyre stressed that Engineers Australia was working proactively to address fire and other safety issues in buildings. “The profession is doing its bit. Just today, we published the Society of Fire Safety Practice Guide for Façade/External Wall Fire Safety Design. Engineers are proactive problem solvers,” he added. Russell said the practice guide provides an industry recognised risk assessment framework for professional fire engineers and suitably qualified professionals to assess and design facades and make sure they are part of a safe system. “It’s about looking at the facade of a building and deciding what fire risks are and how to manage them,” he explained, adding that cladding was one of a number of materials that might be used in a facade. The guide includes a decision-making flowchart to streamline the risk assessment process, as well as a range of questions the engineer should be asking themselves in consultation with stakeholders as they work through the process. According to Jonathan Barnett, Chair of the Engineers Australia Society of Fire Safety, the practice guide is the first of six that his Society is creating. “It’s all part of a new program for developing national guidance for the fire safety engineering community,” he said. Engineers Australia’s Society of Fire Safety has also worked in partnership with the Insurance Council of Australia to produce a protocol to identify and report on non-compliant cladding. According to a recent report released by the Warren Centre, the accreditation of fire engineers is another area that requires a unified and robust national approach. While Queensland requires that all engineers, including fire engineers, are professionally registered and have completed an accredited university degree, other states have widely varying requirements for people “suitably qualified” to carry out fire engineering tasks on buildings. Western Australia has no requirement for fire safety engineers to be registered. What’s more, all states mutually recognise registration, which means fire engineers can ‘shop’ their registration from one state to practice in a state with more stringent requirements. The Warren Centre report also highlights that there are few accredited degree programs for fire engineers around the world. Only one course – available at the University of Queensland – is accredited by Engineers Australia. “If we want to have more fire engineers and better skilled practitioners we need to get more institutions around the country developing Engineers Australia accredited programs,” Russell said. Update: The NSW Government has announced plans to introduce registration for engineers who complete building certifications. The new scheme is based on recommendations from the Shergold and Weir report. If passed, it would require every party at every stage of the construction process – from design to the final build – to be qualified and registered. A Building Commissioner will enforce the new laws, and regulators will have to approve any changes to a buildings plan after the design stage is complete. “It was encouraging to hear that the NSW Government will introduce registration for engineers who sign-off building designs and those who certify that buildings are constructed as per the design,” said Engineers Australia CEO Peter McIntyre.